Mallacoota locals have had their first look at their new $600,000 medical centre being built in the middle of town – and they were happy with the progress. Federal Member for Gippsland Darren Chester officially opened the partially-built centre for inspection and was among the first to see inside the new community asset. “I’m proud to have worked with the community to secure a $300,000 grant to help fund the construction of the new medical centre in Maurice Avenue,” Mr Chester said. 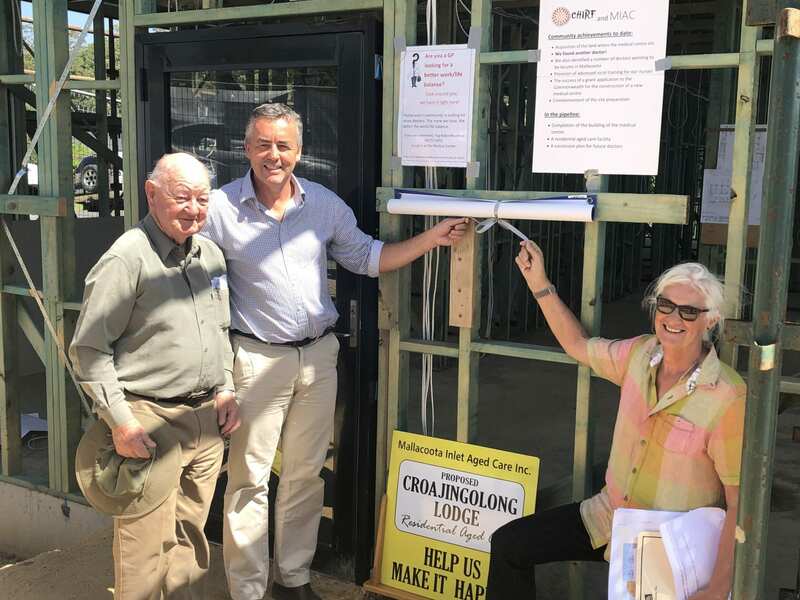 “The building currently under construction is the result of many years of hard work by the local community, led by Mallacoota Inlet Aged Care and the Mallacoota Community Health Infrastructure and Resilience Fund. “This new facility will be finished by the end of March and is a crucial element needed to boost medical services in Mallacoota, by providing the space needed for doctors, nurses and other practitioners to see patients and for health professionals to gain valuable training in a remote area. When completed, the new centre will comprise three consulting rooms, a treatment room, training room, office space and a room for a nurse practitioner. Monday’s event marked the halfway point of the project with the major construction work finished and internal fitout to begin. The site will be closed to visitors to enable this work to be done, before it is officially opened and ready for use. The centre will also be fitted with video conferencing and other specialist equipment to help reduce the need for patients to travel to Orbost or Bega for treatment. The Federal Government funding was secured through the $13.1 million Rural General Practice Grants program. Orbost Medical Clinic received $13,000 for medical equipment under the same grant program. “The people of Mallacoota who have been committed to this project for many years should be really proud of what they have achieved,” Mr Chester said.